I'm starting to see light at the end of the (Behind Tunnel). I can't believe that I'm so far behind that August winners projects are still not mail out and we are alomst to the end of September. Better late than never I guess. I did mange to get the Top Commentators for August projects completed they are drying now. Will post them tomorrow. Need a FAVOR. some of you have already done this and I really APPRECIATE your support. For those of you who have not, I really would APPRECIATE your support as well. 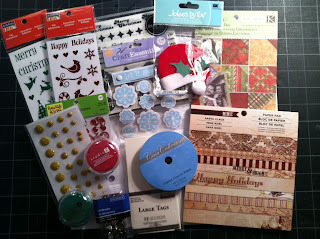 Tara & April from Crafting Desert Divas is hosting a Christmas Goodie Giveaway. This is open to US & Canada Residents only, due to shipping cost. I LOVE the paper in the MME Happy Holiday pack. You have two chances to win! 1. You must be a follower of my blog, leave a comment. 2. Put this picture on your sidebar with a link back to here or post about this giveaway on your blog, leave a comment that you've done so. Ends 10/19 I will post a winner on 10/20. I will use random.org to pick winner. So hop on over and while there take a look around. They are both very creative you want be disappointed. Click HERE now. Candy form Candy's Craft Corner is hosting a 600+ Follower Giveaway. Here is what Candy has to say about it. Make sure you leave me your email address so I can contact you if you win! Sorry but this giveaway is open to Canada & US residents only! Shipping is crazy!! I will let this candy run for 3 weeks! Draw will be on Oct 16/12! So get out there and spread the word! So hop on over and while there take a look around. Candy is very creative you want be disappointed. Click HERE now. Cards did not go out today. One participant was running a little behind getting her cards out. I spoke with her, they are in the mail and hopefully I will have them tomorrow. Cards will go out either way on Wednesday. Sorry for the delay. 1. Do you design blogs? No, it took me weeks to get mine ready to publish. I found a free template and it took me week to tweak it to be what I wanted. I'm not saying I never would, but right now I prefer to spend my time crafting. 2. You used to reply to all your comments on your blog and now you don't. Yes, I used to reply to all comments via my blog. However, I presumed that after someone read a post and commented, they most likely are never going to come back to that post again. Therefore, I felt it was a waste of time. I appreciate all comments and they way I prefer to thank someone is by visiting their blog and commenting on their latest post. Thanks for posting and sharing all the info. Hi nana!Thanks for the Wonderful daily news! !Thanks for the updates on Giveaways! !Can't wait to see your upcoming posts!! Thanks for the heads up on the candy giveaways. Have a great day. Looks like some candy giveaways going on! I will have to go check them out! Thanks for all the updates about the blog candy...must check those out! I feel like I am never caught up in my crafting...there are so many things I want to do and then it is the end of the month....Always next month right...LOL!! Thanks for all the updates and have a GREAT hump day!! Hi, Nana! I clicked above and it took me to a Facebook page that is basically blank (it has a drop down box and a "like" button) and there was no picture of a Haunted House to leave a comment as you requested. Did the link direct me to a wrong page? I'm so glad we found each other and get to be bloggy friends! We have a lot in common! You are always right on top of all the latest things around the web. Fabulous UPDATE. Congrats to all your winners...super generous of you!!! I think I may have already LIKED your Haunted House, but I will peek again to double check! Wow Wee Congrats Winners. TFS The giveaways! !